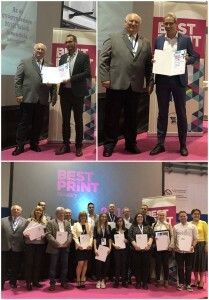 ANY Security Printing Company Group this year again achieved excellent results at Best Print Hungary 2019 i.e. at the professional competition organized by the Hungarian Association of Paper and Printing Industry. The Awards Ceremony was held on 10th April 2019 in PPDExpo. ANY Security Printing Company received the gold level prize in category ’Security edition – stamp, securities’, for the stamp block that was issued in memory of the Saint Stephen battleship and produced by ANY for Hungarian Post. Moreover, ANY won two shared bronze prizes in the same category. One of them was given to ANY for the Ivorian fee stamp samples that were produced in five denominations including different security components (UV-fluorescent and Anti-Stokes security inks, unique hologram, security fibres and security graphics). The professional jury awarded the other bronze prize to ANY Security Printing Company for the Herb of the Year 2018: Real Lavender stamp block produced by ANY for Hungarian Post. Peculiarity of this special block version is that after rubbing the surface of the stamp it will smell like lavender. Jury of the competition awarded the silver level prize in category ’Periodical’ to the eurostyle issue produced by Gyomai Kner Printing Company which is the largest domestic subsidiary of ANY Security Printing Company Group.